These were the words uttered by Senate Chaplain Barry Black on 2 January 2019, as he opened the US Senate with his daily prayer, an activity he has been undertaking for the past 15 years. The partial shutdown of the government started on 22 December 2018, after negotiations between President Trump and Democrats on the US-Mexico wall came to an impasse. Having failed to secure funding for the wall, the president declared a shutdown and said he was “proud” to do so, a statement that has sparked anger and fear among many, myself included. The country has since come to a standstill, affecting the livelihoods of an estimated 800,000 federal employees. For those of us who were hoping for a positive start to 2019, things are not looking promising. Chaplain Black is accurate when comparing these events to warfare. When we think of war and violence, physical violence is what generally comes to mind. But violence can also be present in the way we communicate with each other. After all, we count on our leaders to work together for the betterment of society, but how can this happen when the fight over power results in a complete breakdown in communication? Threats and insults abound, with Trump claiming he will take any action necessary to get what he wants, and Democrat House Speaker Nancy Pelosi making comments about the president’s manliness (or lack thereof). Words are being tossed around by those in power with little consideration as to how they will impact the nation, and I, for one, am disheartened at the carelessness of our leaders. Ever since my childhood I have been worried about saying the “wrong” thing, and as a consequence I often internalize my feelings. The description above of what constitutes Right Speech from the Subhasita Sutta: Well Spoken is enough to make me keep my mouth shut for the rest of my days! Thankfully, a few years ago I came across a book titled Nonviolent Communication: A Language of Life, in which psychiatrist Marshall B. Rosenberg describes a method of speaking and listening “that leads us to give from the heart, connecting us with ourselves and with each other in a way that allows our natural compassion to flourish.” (Rosenberg 2003, 2) Here, the term “nonviolence” comes from Gandhi and refers to “our natural state of compassion when violence has subsided from the heart.” (Rosenberg 2003, 2) There is a detailed process for attaining this state that goes against the way most of us have been culturally brought up. Instead of passing judgment on what is being said in a conversation, we learn to observe without evaluating and listen for the feelings and needs being expressed behind each sentiment. 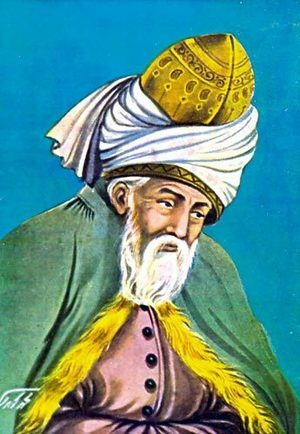 Depiction of Rumi, the 13th Century Sufi poet. Try as I may, I find it very difficult to practice in this way when President Trump says he is proud to shut down the government “because the people of this country don’t want criminals and people that have lots of problems and drugs in our country.” (CNBC) When we struggle to connect empathically with others, Dr. Rosenberg advises us to empathize with ourselves. So, what am I feeling and needing when I hear the president’s statement? Looking deeply inward, I feel a lot of hurt and sadness. My need is for all fellow human beings to be respected and safe, whether they are American citizens or not. Recognizing this allows me to sit with these feelings and connect with the compassion that is in my heart, going beyond judgments I have about our current leader. Now I can try to identify the feelings and needs expressed by Trump. So, following Dr. Rosenberg’s advice, I may ask him “Are you feeling frustrated? It appears you may have had some bad experiences with immigrants.” In this way, I am fully willing to hear what he has to say. Perhaps it will become clear that he is scared and wants to protect himself and his loved ones. Who knows, if our politicians are willing to open their hearts and communicate nonviolently, 2019 may yet have some pleasant surprises in store for us.